Despite the fact that retention is key for SaaS and mobile growth, there's very little consensus on the factors that indicate good retention. Should you base retention rates on subscription renewal, the number of logins, recurring revenue, or something else entirely? With all the different use cases and opinions out there, it can be tricky to discern what matters for your product. Amidst all the noise, here's the important thing to remember: use a leading indicator to measure retention. In other words, pick a retention metric—like in-app activity—that helps you predict who's likely to stop using your product and who's likely to stick around. With a leading indicator, you can build intervention strategies that help you increase your retention rate. While calculating retention rate using trailing indicators—like subscription renewal or revenue—can be useful for pitch decks and financial projections, it's not very actionable. Once a user has churned, they're gone. You can't go back in time and make them stay. Discussions of retention analysis using leading indicators most often fall under the umbrella of “user retention.” When reading about retention around the web, keep an eye out for this term if you're looking for resources that will actually help you move the needle. 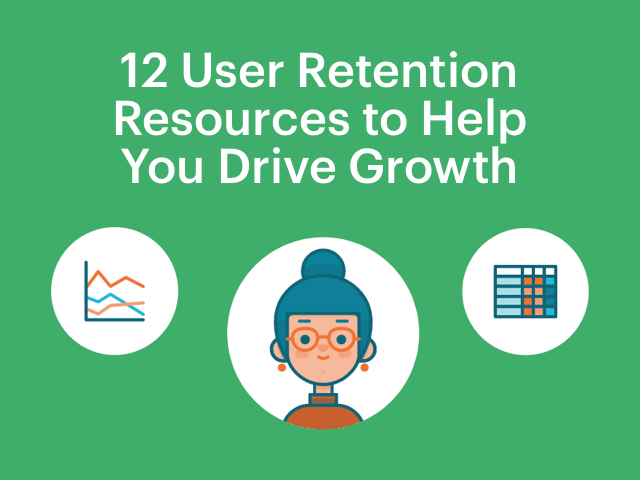 With that in mind, here are the user retention resources that we've found most helpful. Note: Since churn and retention are basically the inverse of each other, we've include some articles on user churn as well. Bonus: Want more retention tips? Download The Essential Guide to Improving User Retention. If you're new to the idea of user retention, these articles will get you up to speed. 2. Churn, Retention, and Reengaging Customers (Intercom) - Intercom is another retention content powerhouse. This post explains the difference between customer churn and user churn (e.g. activity churn) and provides tips for crafting great re-engagement emails. Cohort analysis has become the go-to way to measure retention. A cohort is group of people who share something in common, such as signup date, device type, or activity in the product. By dividing users into cohorts and visualizing their retention as a heatmap, you can see retention rate changes over time and compare rates across cohorts. The articles below will teach you about cohort analysis and why it's critical for tracking retention rates. 3. Why You Need Cohorts to Improve Your Retention (Amplitude) - This mega-post from Amplitude offers clear instructions for dividing users into cohorts based on signup date and behavior—and what analyzing them from these different angles can accomplish. 4. How to measure if users love your product using cohorts and revisit rates (Andrew Chen) - Andrew Chen makes the case that user retention is the single most important metric for determining if users love your product. One important nugget in this article: the difference between retention and engagement, which people often conflate. 5. Know your user cohorts (The Angel VC)- Christoph Janz has been warning startups about the consequences of ignoring cohort analysis since way before it was cool. This post shows how segmenting users into cohorts can reveal much more than an aggregated retention metric. 6. Excel template for cohort analyses in SaaS (The Angel VC) - Another post from Christoph Janz detailing the anatomy of cohort analysis charts and how to read them. 7. Cohort Analysis That Helps You Look Ahead (Mode) - Traditional cohort analyses group users by the date of signup, which is great for measuring retention, but not for figuring out what to do next. To do that, you'll need to group your users into demographic and behavioral cohorts. Establishing good, stable retention is the first step toward growing your company. Without it, you're just filling a leaky bucket. These resources explain why you should dedicate resources toward getting users to stick around. 8. Retention is King (Jamie Quint) - Having engineered growth at companies like Twitch and Hipmunk, Jamie Quint knows firsthand that retention trumps virality—and he's got the growth models to prove it. 9. Why Retention is King of Growth Strategy (OpenView Labs) - Brian Balfour, VP of Growth at Hubspot, shares his tactics for handling retention optimization challenges. Available as both a video and a transcript. Should you be measuring classic user retention or rolling user retention? These posts get into the nitty-gritty of how retention can be calculated and provide some caveats to keep in mind. 10. User Retention: Yes, But Which One? (AppLift) - When someone hands you your product's user retention rate, the first question you should ask is: how did you calculate this? There are bunch of ways to calculate retention, each of which will leave you will different results. So you don't end up comparing apples to oranges, the folks at AppLift have laid out five different ways to calculate retention. 11. Data Recipe: Calculating User Periodicity to Define Churn (Appuri) - Do your users login a few times every day? Or do they use your product for a couple hours once a month? It's critical to nail down user periodicity to calculate retention metrics that actually apply to your product. In this post, Appuri provides incredibly detailed instructions and SQL queries to do just that. 12. 3 Things Your User Retention Rate is Hiding (Mode) - Mode's chief analyst Benn Stancil reveals three additional metrics you need to consider to get your user retention rate right for your product. Be sure to check out The Essential Guide to Improving User Retention, which will show you how to use your data to go beyond run-of-the-mill retention analyses and find actionable steps to accelerate growth. Grab your free copy of The Essential Guide to Improving User Retention to learn how to build custom retention analyses.